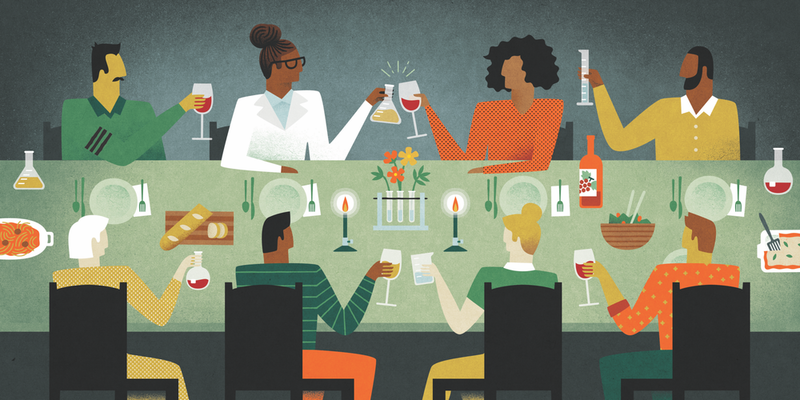 A new initiative encourages scientists to host dinners for their local community to eat, drink and build trust between scientists and the general public. Have a medical question? You can call your doctor’s office. Have a car problem? You can call your trusty mechanic. But if you have a scientific question or worry, where do you turn? There’s no such thing as a friendly neighborhood scientist. That could soon change. Catharine Young, a scientist and TED Fellow who currently serves as the Senior Director of Science Policy at the Biden Cancer Initiative, thinks the dinner table could be an effective platform for discussion, debate and building trust between scientists and the public. Along with her husband, fellow scientist Colin Young, she’s created Supper with a Scientist, a dinner-hosting platform that’s connecting scientists with their local communities, opening up dialogue around scientific issues and policy. We asked Young to tell us more. How did Supper with a Scientist start? It all started with my deep concern, at the start of the Trump administration, that science was going to suffer during his term. Even on the campaign trail, Trump helped spread misinformation about science — he connected vaccines to autism and perpetuated the idea that climate change is a Chinese hoax. As time’s gone on, things have worsened: there’s been a silent attack on science within several federal agencies, which has been very disconcerting. The White House Science Advisor, a crucial position that provides independent science and technology advice to the president, dealing with issues ranging from nuclear energy to drones, has also been left vacant longer under this administration than under any other modern US president. As a scientist and policy advisor myself, I felt compelled to do something — anything — to curb the misinformation being spread. I also wanted to address the divide between scientists and the public. Particularly in today’s political environment, there’s definitely a sense of mistrust, possibly because there’s so much conflicting messaging on social media and the internet. The public doesn’t know what to believe, and rightly so. My solution: to put people in direct, real-life touch with scientists. Supper With a Scientist gathers communities together around a table for dinner hosted by scientists across the country. Over food, scientists talk about their work, the role of science in the policymaking process and answer any questions the guests might have. Prosanta Chakrabarty (far left) is an ichthyologist, associate professor in the Department of Biological Sciences at Louisiana State University and TED Fellow. His supper, hosted August 2018, had a twist: Chakrabarty offered guests a tour of the university’s Museum of Natural Science, where they got a behind-the-scenes look at the collections of birds, mammals, reptiles, amphibians and fishes before dinner. How does public opinion — or confusion, or fear — around science affect policy decisions? It’s probably best viewed the other way: what kind of impact can an administration’s actions on science have on the public’s perception and understanding of science? Take climate change, for example. When this White House withdrew the US from the UNFCCC Paris Agreement, it essentially reinforced the message to the public that climate change is a hoax or, at best, an exaggerated threat. With a complex topic like this one, where the majority of people cannot describe in detail what climate change is, or how it works, they listen to those in power. Right now they’re hearing that it’s not something to be concerned about. This is a catastrophic position for society to be in, but it is also something the scientific community has the power to change. How did you get the idea of the Supper off the ground? We started out by forming an advisory committee of young and dynamic scientists across the United States who started hosting pilot suppers, inviting people from their own communities. With this pilot launch, we wanted to make sure that we were actually addressing an unmet need with the public. What we’ve seen so far is a very strong positive reaction. It turns out that people are extremely excited to be given access to an expert whose brain they can pick and whom they can trust. Does Supper with a Scientist impose any kind of format in terms of finding topics or the Q&A process? Yes. We’ve created guidelines for scientists because there are a couple of things we want them to be really aware of. One is crafting their scientific message so that it’s compelling, easy to understand and interesting. We also offer ideas about how the dinner should be structured. Host scientists will have a table full of people that they might not know very well, or at all, so they’ll start the dinner with a round of introductions and ask why people felt compelled to take time out of their hectic schedules to attend. The scientist then lays out their area of expertise, why it’s important and how it relates to their guests, and what it is they do on a day-to-day basis. From there, the discussion can open up to, say, the scientific process — answering questions about how science operates in terms of funding, the tenure process and what that means in terms of having to publish, working with animals and looking after their welfare and so on. Besides chatting about their own area of expertise, the overall idea is to take the opportunity to dispel some of the myths out there about scientific research and processes that upset or confuse people. What’s better than a supper with a scientist? A supper with two scientists! 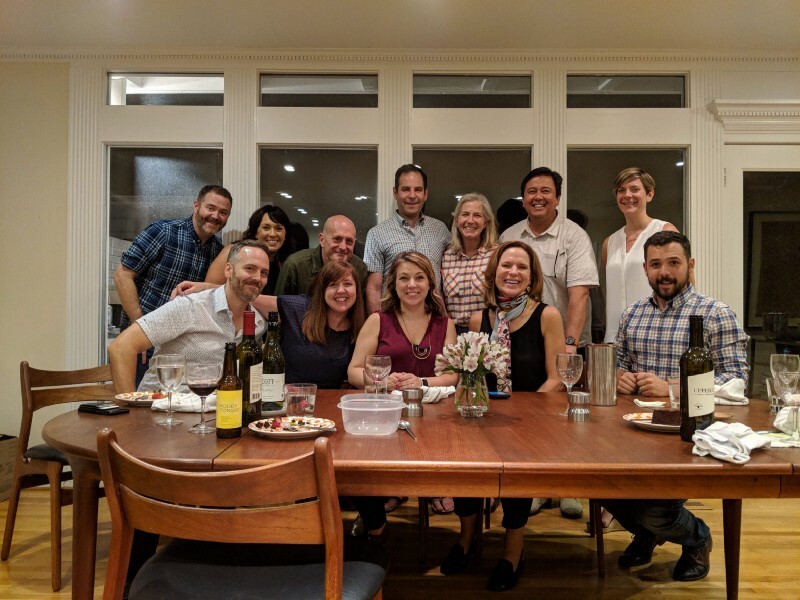 In July 2018 in Atlanta, GA, microbiologists Summer Galloway and Patricia Hall hosted a dinner where they discussed topics ranging from the government’s role in science to why the US invests in tuberculosis research. Is it like a TED talk, with a time limit? Our goal is for this to be an open dialogue, so there’s no limit on how long the scientist speaks, but they don’t stand up with slides and talk at people. Having said that, we encourage scientists to be prepared with what they’re going to say, because the last thing we want to do is have a dinner where people walk away and go, ”Wow, I just didn’t understand a thing”—or wonder why they should care about the science in the first place, which would be counterproductive. Do you think that public scientific communication was generally in good shape before the latest White House administration came along? I think it’s always been somewhat problematic, but the extreme and divisive views of this administration has exacerbated the problem and created even more of a need. The public has long perceived that scientists live and work in ivory towers and don’t share much with anybody. On the flip side, scientists tend to believe that the public either isn’t interested in what they’re doing, or won’t understand the work. So there’s never been a solid bridge between science and the public. We’re hoping this might be a start. There are, of course, fantastic online resources that aim to distill science down, but this approach relies on the public actively seeking out that particular type of information. Also, I’ve learned that conversation really matters. I was lucky enough to meet Celeste Headlee, NPR host, TED speaker and author of We Need to Talk, who enlightened me about the art of conversation. She says that the fact of just listening to somebody’s voice changes the way your brain processes information, so a conversation has much more impact than just reading something or seeing it on your phone or computer screen. Supper with a Scientist brings the scientist’s human, responsive voice into the mix, creating that connectivity. By doing this, I think we can really start to have an impact. What if people want to engage scientists in controversy, and there is conflict? In our guiding principles, we note that different views and opinions are encouraged and, more importantly, accepted. We feel this is so important to stress, particularly in the ever-increasingly intolerant society we find ourselves in. The host, however, can set a few boundaries at the outset so that if the conversation gets out of hand, or if somebody starts to become unruly, they are empowered to shut it down and say, “We’re moving on.” Of course, we don’t want to ever get to that point. Hopefully the guidelines establish that this is a respectful and safe place for diverse views to be aired.